Advertising is a looming issue for me and my family. Nevermind how we've all been driven bonkers by just the sheer amount of buy buy buy info coming at us. (I just want to rest my eyes on something blank sometimes, but in my city, unless you want to crank your head straight up to the sky, that is not possible.) When you have kids, you notice how many ads are directed towards children, and it can make you feel a bit irritated (or wild eyed pissed off) at how they encourage children to desire unhealthy foods, or bug their parents, or feel inadequate one way or another. Urban areas are definitely ground zero for ads, but if you've taken a country drive lately (or travelled between two cities) you might notice that someone's been running around putting up billboards in farmer's fields every quarter kilometer or so along the busier highways. And hay is now stored in plastic wrap with beer ads on it. About the same time that I was deciding that, no thanks, no ads on my blog I kept noticing the little ad-free blog owl on other people's sites. I always love to see the owl. It says, 'yes, I could have ads, I'm miss popular blog, but I choose not to. So there.' Good stuff! Plus owls are cool, yes? 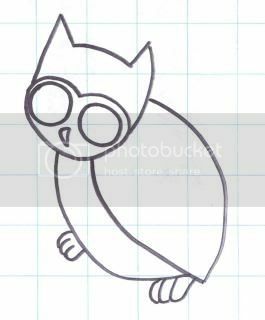 So, I did a quick sketch of a little owl that I wanted to make into a stencil or something for a tee and make it all into a 'ad-free bod', all in honor of the ad-free blog owl and my decision to not accept advertising. Then life happened, and I got distracted, and some more stuff happened, but now, months later, I finally got around to doing something with my little owl. 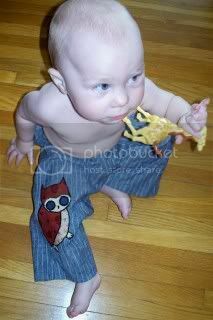 My son is now sporting a owl applique on his new pair of trousers, made from my old trousers. Using a sheet of iron-on bond paper, trace out the various elements of the applique on the non-glue side. 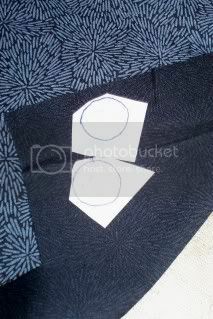 Following the manufactures instructions, iron the bond paper to the wrong side of fabric. 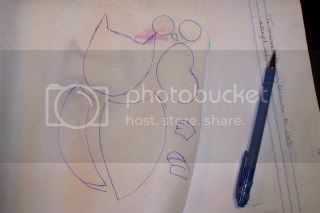 Cut out the traced shapes. Peel off the paper backing of the bond paper and arrange the various elements of the applique on the material to be appliqued. Once it all looks good, iron the applique in place (check manufactures instructions). If you are applying the applique to thin material, place a used dryer (static) sheet on the back side of the fabric you are appliquing on. This will give it a bit more strength and prevent stretching or awkwardness in the stitching. After the applique is done you can snip off the edges of the dryer sheet to neaten it up. Load up either complimentry thread to the material you are appliquing or choose a single colour for the whole applique. Set your machine to a satin stitch (a tight zig zag stitch). 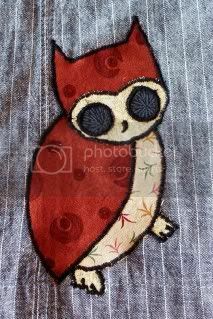 Follow the edges of the applique elements with the satin stitch to secure the applique to the fabric and outline the design. That owl is the cutest thing I've seen today! I contemplated ads at one time, too. It just isn't worth it to me. I occassionally get advertisers asking me to hock a product, but I've now taken my ad off of updating search sites (google, etc.) so I get less visitors...thank goodness. Having a bunch of people visit my blog and not leave comments as it is bothers me at times. I think ads "junk" up the site. Too much to look at and it all gets lost/mixed in with the important stuff. 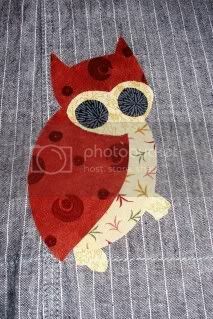 I have the owl on my blog (he's lived there for a few months now) and he will live there till I'm done blogging. Love your sons pants too. Applique is always so much fun for me, but I don't do it as often as I'd like. 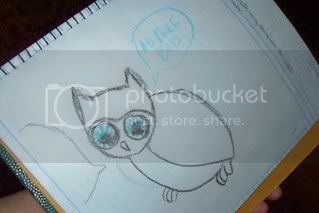 The owl is very cute! Thanks for sharing him with us. I have adored you since the day I found your wrap pants tutorial a while ago....now I adore you even more! yes, it is a relief to come here and be ad-free. Thanks for that! I was watching a 20 minute film clip called 'The Story of Stuff' (it's an overview of consumption and production - http://www.storyofstuff.com/, pretty cool!!) and was absolutely astounded to hear that in America 3000 ads are targeted at each individual every day. Crazy! Here in Australia I get irked about seeing ads, but after hearing that I realised how lucky we are! It's not nearly as bad as that. ITA! I just found your site today because someone recommended your sweet butterfly clip tute and really enjoyed looking around. I feel the same way about ads and have turned down a lot of ads over the years on my site because it just didn't feel right. I share my stuff for the love of kids (and parents and others who love them) and it's worth the extra cost to me to be able to keep it ad-free. Thanks for the neat blogs. I'll be back! Love the owl! Reminds me of my daughter's valentine cards last year, pic of owl on front of card, inside reads: "Owl" always be your friend! Thanks for all the neat stuff on the site!